This is the 9th year of the annual SoundOut festival, and in 2018 we will bring to you the continuation of the incredible explorative sonic arts event. This is the International Free Improvisational, Free Jazz and Experimental Music festival to will uplift tired ears, explore the unknown, see within the fabric of sound, unravel the threads of normative musical praxis, and question sonic hegemonies. With artists from Australia, Austria, Denmark, France, Norway, Sweden and the US that will combine, mix, cross-fertilize, and move sound mountains to inspire inquiring ears. SoundOut 2018 sees the extraordinary Artists: From Norway and Sweden a duo of: Sten Sandell (piano), and Paal Nilssen-Love (drums); From Austria and France the Duo: Franz Hautzinger (trumpet) and Isabelle Duthoit (Vocals/clarinet); from the US, vocalist Bonnie Lander and expat cellist Judith Hamann; From Germany saxophonist Georg Wissell; From Denmark (bassist) Adam Pultz-Melbye and expat (guitarist) Julia Reidy in the Duo: Tennis of all Kinds; From Sweden John Moir (bassist) with expat Casey Moir (vocalist) in the briliant duo called Ignite; From Malaysia electroacoustic artist Goh-Lee Kwang; From Melbourne: Prime: saxophonist Scott McCounnachie and guitarist Ren Walters duo; From Sydney: vocal artist Tony Osborne, Electronic /clarinet Alexandra Spence, Romy Caen harmonium/feedback/perc and Prue Fuller voice/small objects/instruments; From Canberra: Miroslav Bukovsky (trumpet), Amelia Watson (objects, toy piano/prepared piano); Psithurism trio (John Porter (tenor saxophone; Rhys Butler, alto saxophone; Richard Johnson, wind instruments) and brilliant young composer/improviser Ben Drury on double bass + many more surprise Artists. The 2018 group of Artists has never gathered before and never will again in the same configuration, but they are all involved in an international dialogue that is essential to the unfolding of new music structures and what it means to be human in the 21st Century. Come, see and hear the new music evolve. SoundOut is very grateful for the generous support from the ACT Government for the 2018 Festival. We are also grateful to the friends of SoundOut, and the volunteers that help with the festival. 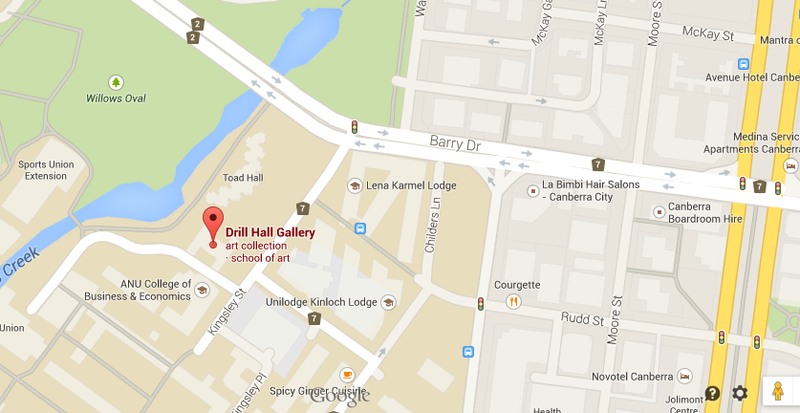 Special gratitude goes to the Drill Hall Gallery and Staff for their consistent friendship, generosity and support; as well as School of Music in Canberra for the generous help with equipment and use of the Bandroom for the Workshops. The Artists would like to thank their respective governments and cultural institutions for their support: The Norwegian Government, the Swedish government; the Austrian Embassy; and the Danish and German Governments. Ben is a Canberra-based composer, improviser and sound artist. His practice deals with experimental, popular and classical music, in performance and composition. His work as a composer is concerned with acoustics, noise and quiet sounds. He is a member of the ANU Experimental Music Studio and New Music Ensemble as a performer and composer and has worked with Ensemble Offspring, The NOISE and the ANU Chamber Orchestra as a composer. His work is beginning to move outside of traditional forms and venues, focusing more on alternative and experimental ways of presenting new music, including the site-specific installation ‘Pieces for Cars Tunnel and Hexagonal vents’ as part of the You Are Here Festival in May of 2016 and some generative and interactive electroacoustic works. He has also performed in the Canberra International Music Festival, the SoundOut festival, the International Conference of Auditory Design, Electrofringe and Art Not Apart. His first album Sentence Fragment Consider Revising is coming out in 2017. Artist. Create sound installations, perform electro-acoustic improvised music, making tape music and composed soundtrack. His works focus on the various possibility of both realistic & abstract, crossing the boundaries of digital & analog, electronic & acoustic, go beyond language & expression. Founder of Switch ON, platform for electronic arts. Founder of Herbal, CD label. Isabelle is a French jazz and improvisational musician (clarinet, vocals) and composer in the area of creative jazz, free improvisational music and contemporary composition music. Duthoit began her classical music studies at the Conservatoire national supérieur de musique et de danse in Lyon with Jacques Di Donato in 1991, which she graduated in 1995. With Donato, she founded the Fruits de Mhère festival for improvisational music in 1994 and composed the theatermusik le temps du souffle . In the second half of the decade she went on a tour with Donato to the United States; She also worked with chamber music performers such as Sonia Wieder-Atherton and Raphaël Oleg. She has performed several times at the Musique Action festivals in Vandœuvre-lès-Nancy, Musique en Scène in Lyon as well as in Romania and the Ukraine. She also worked in the Ensemble Triolid (album Ur Lamento 2002 with Laurent Dailleau (Theremin) and David Chiesa (bass, percussion)) with Taavi Kerikmäe and with Tim Hodgkinson ( Sketch of Now , 2006). In the duo with the pianist Jacques Demierre, she recorded the album Avenues (Unit) in 2004. She is a clarinetist in the trio Krizda with Christine Wodrascka (piano) and Gunda Gottschalk (viola), plays in the formation archipelago of Emmanuel Petit and is the founder of the trio Bords de Mhère (with Kristof Guez and Marc Pichelin). She also worked in the course of her career with Johannes Bauer, Camel Zekri , Michel Doneda , Franz Hautzinger and Géraldine Keller . In 2001 she appeared with Joëlle Léandre and Marilyn Crispell at the Festival Confrontations in Nickelsdorf. In Japan, she studied the Nō rituals during a stay at the Villa Kujoyama in 2008 and in 2011 she participated in the Villa Medici of Rome together with Ryōko Aoki. In 2012, she was a member of Carl Ludwig Hübsch's Ensemble, as part of the SWR New Jazz Meeting; She also belongs to his quartet drift. The new magazine for music characterized Duthoit as part of "a musical movement in France, which wants to break the boundaries between new composer and improvised music”. Born in Toowoomba in 1985, John is a formidable young saxophonist with a deep interest in free improvisation. After starting on the clarinet at an earlier age he switched to the tenor saxophone and never looked back. In 2003 John moved to Brisbane to study music full-time, completing a Bachelor of Music in 2005 and a Master of Music in 2008 where his thesis was on the avant garde composer Cornelius Cardew. It was during this time that John received his first exposure to improvised music, participating in a number of groups in and around Brisbane. He has since played with a number of artists including Shoji Hano, Jeff Henderson, Kris Wanders, Madoka Kouno, Elliott Dalgleish, and the Stasis Duo, and appears on recordings released by the [Array] and Homophoni labels. John is currently in a saxophone trio with Richard Johnson and Rhys Porter called Psithurism Trio. He currently has a new release with the Psithurism trio on the SoundOut label called Lure. Judith’s performance practice stretches across various genres encompassing elements of improvised, art, experimental, and popular music. Judith has studied contemporary repertoire with cellists including Charles Curtis and Séverine Ballon, as well as developing a strong practice in improvisation and sound practices through collaborative projects both in Australia and internationally. She has worked with artists and ensembles including Oren Ambarchi, ELISION ensemble, Dennis Cooper, Maya Dunietz, Graham Lambkin, Alvin Lucier, Roscoe Mitchell, Michael Pisaro, Wadada Leo Smith, Ilan Volkov, Tashi Wada, Manfred Werder, La Monte Young, and John Zorn. Judith is a founding member of Golden Fur (with James Rushford and Samuel Dunscombe) and Hammers Lake (AUS) with Carolyn Connors. She also performs in unique duo projects with Anthea Caddy, Bonnie Lander, and Rosalind Hall. She has performed widely with festivals including Tectonics (Glasgow, Adelaide, Tel Aviv), UnSound (NYC), Adelaide Arts Festival, Melbourne International Arts Festival, The Now Now (Sydney), Dark Mona (Hobart), Extremities Japanese Australian Festival (Tokyo), Tokyo Experimental Festival, SiDance Festival (Seoul), Ausland Summer Festival (Berlin), and Liquid Architecture (AU). Other performance highlights include improvised or repertoire presentations at Cafe Oto (London), Issue Project Room (NYC), Dia Art Foundation (NYC), Steim Institute (Amsterdam), Logos Foundation (Ghent), LaSalle University (Singapore), SuperDeluxe (Tokyo), and Tempo Reale (Florence). 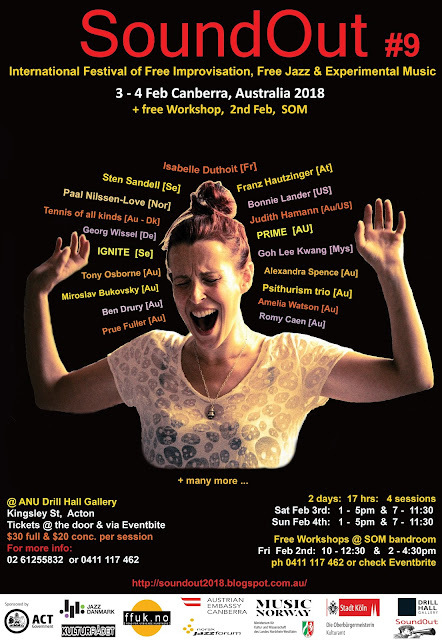 She is a champion of new and rarely performed music, immersive approaches to sound, and engages with a range of interdisciplinary and experimental projects including the Amper&nd project (South Korea/Australia), and collaborative work with visual artists Keith Deverell and Sabina Marselli. She has been an artist in residence at Tokyo Wondersite Aoyama, and Q-02 (Brussels). Julia Reidy is an Australian guitarist, improviser and composer now living in Berlin, who is being increasingly recognised as one of the country's most unique emerging talents. Drawing upon a variety of diverse musical influences, her musical approaches are informed by an exploratory attitude towards musical vocabulary in the context of both improvised and composed structures. She currently performs and collaborates with notable musicians such as Clayton Thomas, Burkhard Beins, Richard Scott, Tony Buck, Hilary Jeffery and Jim Denley. She has recently been based between, and deeply immersed within the improvised music scenes in both Sydney and Berlin. Millie is a classically trained pianist from the ANU School of Music and a member of the Canberra Experimental Music Studio. She performs around Canberra, composing sets comprising of found sound recordings that in turn inspire live improvisation. Inspired by Feldman and Cage, Amelia’s style draws upon classical forms yet is rooted in a desire to explore the quality of sound and Improvise. She performs regularly around Canberra. Miroslav worked for the ANU School of Music Jazz department in Canberra for many years until just recently and has been the Distinguished Artist in Residence since 2013. He was one of the founders of the renowned Jazz ensemble the Ten Part Invention (TPI) along with Roger Frampton and John Pochee; has played with the Free Boppers, the KMA Orchestra and the Australian Art Orchestra. He has led the award - winning ensemble Wunderlust for many years and remains active composing and performing with them and TPI. He has also played in the experimental jazz trio Pollen Trio with Austin Bucket and Evan Dorrian and in a trumpet trio with James Greening and Reuben Lewis recently. He is a staunch experimenter and improviser and relishes the opportunity that new grouping provide. Prue is a Sound Artist from Sydney that has been exploring the world of Art Brut’ and improvisation. She has been playing improvised music, predominantly as a member of Splinter Orchestra, since 2014. Her approach to improvisation comes strongly from creative play, investigation and experimentation. She uses her voice and a number of small objects on glass to shape and explore the textures of sound. Prue plays regularly with Splinter, but also in smaller groups; notably a duo with Melanie Eden and a quintet named TQF4M1 with Andrew Fedorovitch, Romy Caen, Melanie Herbert and Laura Altman. She has performed at the NOWnow festival, Tectonics Festival and Siteworks at Bundanon Trust and regularly performs at a number of venues around Sydney. Romy Caen is a musician from Sydney. Since 2012 she has been playing harmonium and electronics in the Splinter Orchestra and in various small groups with musicians such as Laura Altman, Melanie Herbert and Jeremy Tatar. In 2008 she began playing in Swill with Tim Wall and Liam O'Donoghue, and over the years has performed at the Now Now Festival, the Newcastle Weekender Festival, Siteworks Festival, Tectonics Festival and in many other small venues around town. Her sounds have been described as the most precise and delicate acoustic minimalism but she is also attracted to the chaos of feedback and the unpredictable noise of her trusty homemade synth. Romy is also an arts studio coordinator currently working in Bankstown after 1.5 years in remote NT at an Aboriginal-owned art centre. Previously she worked for Brand X to establish Tempe Jets, a music studio and rehearsal space, and Camperdown Clubhouse, a visual art studio. She also co-founded AV Union, an artist run space on Parramatta Rd, and established Shepherd Studios, an art studio complex in Marrickville in 2013. Experimental event series’ she has coordinated include psh.live at Anyplace Projects and Sound Series at Hardware Gallery “a highlight of the alternative music scene” – RealTime Arts. Sten is in a greater context a Composer / musician / producer - piano, organ, voice, electronics Artist. Tony has collaborated with many visual, sound, theatre and dance artists. Since 2002 his music collaborators include Cameron Deyell, Clayton Thomas, Clare Cooper, Sam Pettigrew, Gail Priest, Amanda Stewart & Rishin Singh and appeared in numerous NowNow Festivals in Sydney. As MADHEAD (solo vocal/electronics) he has performed in Sydney, Melbourne, Brisbane and Soundout 2012 (with Rishin Singh), Canberra. His ongoing duet project as vocalist with sax player Andrew Fedorovitch has also been heard in Sydney (Nownow Festival) & Berlin (Studio 8). He is also a bass singer with Sydney University Graduate Choir and Splinter Orchestra (both since 2009). He performs and teaches performance improvisation around Australia and his 30 years of theatre and dance practice has, in the last three years taken him to perform in Basel, Shanghai & New York. He also writes on music and dance for Real Time arts.